Similar to treatment with Laser, Radio-Frequency Ablation (RFA) is a minimally invasive treatment that does not require the patient to be put to sleep. Also like laser, it is a heat based treatment of the vein from the inside. 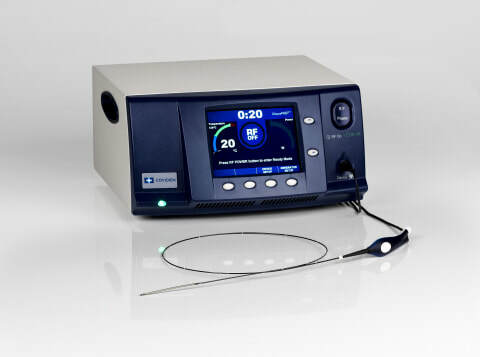 There is little difference in the outcome or procedure involved between Laser and RFA, although the lower temperatures of RFA tend to make the period after treatment less painful. RFA is a procedure carried out in a procedure room. The patient undergoing treatment is usually awake throughout the procedure and local injected anaesthetic solution is used to make sure that the treatment area is numb. Once the patient has got changed into the procedure gown and the legs measured for compression stockings, the patient is taken to the treatment couch and tilted so that the legs are slightly lower than the head. The leg is cleaned with a sterilising solution and scanned for a suitable vein for access. Local anaesthetic injection is used to numb the area before a needle is introduced followed by a small tube, called a sheath. Through this sheath the RFA device is passed inside the vein up to the top the leg. The position of the device is ensured by continuous ultrasound guidance. Once in position the patient is tilted slightly head down so that the blood in the dilated veins empties. 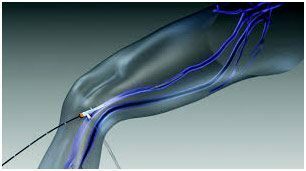 The collapsed vein and the surrounding tissues are injected from top to bottom with numbing solution before the RFA device is triggered. The RFA device treats 7cm sections all the way down. Once completed, the compression stocking is put on the treated leg and the patient is allowed to mobilise immediately. Before RFA you will be seen and assessed by a specialist vascular surgeon and will have had a detailed scan of your veins. The scan is performed to ensure that your veins will be appropriately treated by endovenous methods. Your surgeon will be able to describe the findings of the scan and the radiofrequency treatment. You should feel free to ask any questions about your treatment until you are satisfied that it is right for you. The procedure will be booked on a convenient date by the CVG administrative staff. You will be given all the information you need for your insurance claim but usually CVG can organise approval directly. Although RFA treatment of varicose veins is well tolerated, there is a period after the first few days and for a period of about 5 days where there is mild to moderate pain, redness, bruising and swelling . Simple analgesia medications is all that should be required; like paracetamol or ibuprofen, both available as over the counter tablets. It is advisable to take these regularly during the first couple of days.